Happy Friday to all of you, it’s time for another photo from my Framed Series so buckle up and get ready because I’ve got a beautiful photo to go perfectly with your morning coffee. 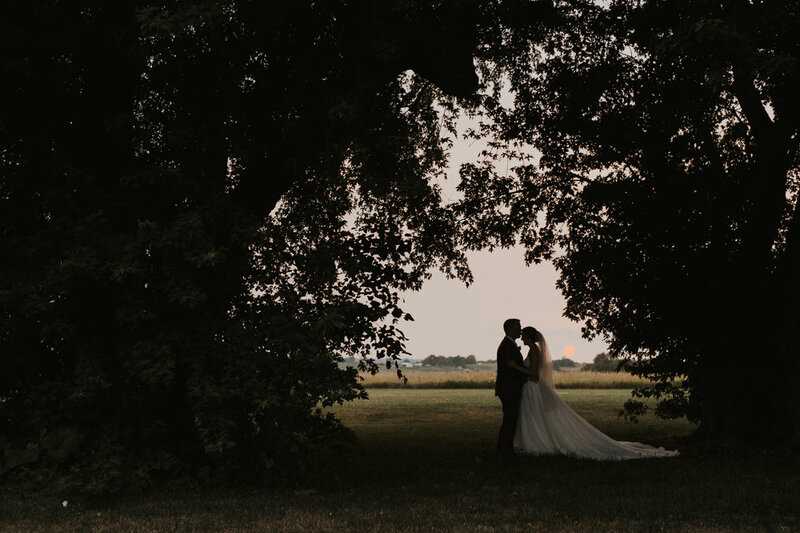 This particular photo was a spur of the moment thing during Theresa and Tom’s wedding at Sugar Grove Vineyard in 2017. The day had unfolded perfectly and it was time for the bride and groom portraits. Normally, I recommend for my couples to do the portraits later in the day to take advantage of the lighting quality and to also give them a little break from all of the festivities. So, the ceremony had just wrapped up and Theresa and Tom were greeting their guests and getting them into the reception hall. Once the guests had gotten seated, we said an opening prayer and began serving dinner, starting with the head table. Theresa, Tom, and I had a standing agreement that we would all eat quickly and then venture out for some beautiful portraits while their guests were eating and be back in when it was time to move on with the toasts and dancing. So, we walked all around the property taking pictures here and there while keeping a close eye on the time. When it was finally time to head back inside we strolled down the dirt path to head back to the main building. Suddenly something caught my eye. I looked off to my left and a little ways away from us, there was a break in the thick foliage…making a perfect archway. On the other side was a beautiful sunset shining it’s light through the opening. Immediately, this shot popped into my head and I just knew that I couldn’t go back to the reception until I had taken this photo. Insistently, I pulled Theresa and Tom over to the space and set them up for the portrait. I wanted them to be nearly silhouetted against the setting sun and hoped that enough detail remained to make out the draping of her dress. The resulting photo was exactly what I had in mind and probably my favorite from the entire day. In this process I learned that sometimes a great photo is there and you just need to make sure you keep your eyes open so you can see it and capitalize on the opportunity when it presents itself. We could’ve easily kept strolling down the path, but I’m glad I happened to glance over and see this opportunity…and I’m sure my couple is too.